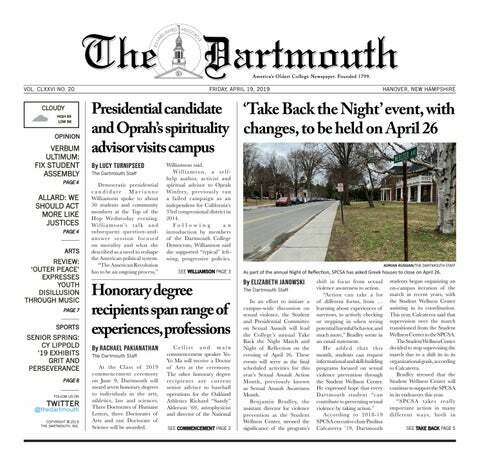 The Dartmouth editorial board wrote in last Friday’s Verbum Ultimum, “Reacting with Respect,” that we would do much better as a campus to consider the issues raised by protesters, rather than to criticize the means of protest — and in general I agree. But in attempting to take my editor’s advice I’m confronted by a problem: with last Saturday’s protests, the issues raised only make sense in the context of the protests themselves. “What is Derby in the face of police brutality?” demonstrators asked the hundreds of sun-hatted students last Saturday during a protest of the event. If I had to think of something that is as far from police brutality as possible it might very well be this annual party thrown at Kappa Delta Epsilon sorority. Perhaps that’s the point — without context, it’s hard to tell exactly which issue last Saturday’s protest sought to raise. The purpose of the weekend’s demonstrations was ostensibly to show solidarity with and support for the protests in Baltimore, and that’s exactly what happened in the streets of Hanover on Friday when people marched across campus on this issue. Yet the goal on Saturday, in the context of the protests themselves, was clearly different. If the aim was merely a show of solidarity, then why did the protestors decline the offer from Alpha Chi Alpha fraternity to share their message from the stage? Why did they opt instead to chant from the parking lot? Rather than including a large swath of the Dartmouth community in a show of support, these protesters elected to remain separate and highlight the difference between themselves and what they perceived as the flippant comfort of their fellow students. Protesters then moved on to Derby where they asked questions like, “What is Derby in the face of a genocide?” Insignificant and comfortable seemed to be the implication. More cynical members of our community might suggest that the protest was designed to catalyze a reaction that would prove the protestor’s point — like the infamous incident with incoming Student Assembly president Frank Cunningham ’16. I won’t go that far. I think that the 20 or so students participating intended to protest Dartmouth students’ ignorance of the problems that plague lives of minorities. The protest was designed to disrupt their day and show them the experience minorities have on a daily basis — to disrupt white comfort and perhaps to create a charged situation that would capture the attention of as many people as possible. They certainly captured attention. The incident with Cunningham is being used to maintain that attention, to prolong the discussion sparked at Derby. But what exactly is that discussion? Is it a problem with gender dynamics? Black men not supporting the cause? The Student Assembly President? White comfort? Affluent comfort? Comfort in general? Genocide? Should we put a hold on all parties on campus until real racial equality exists in the United States? Far more than other protests I have seen at Dartmouth, last Saturday’s became a divisive display. Whether it was designed to be so or not, the reality is the protest highlighted the difference between the protesters and those they protested. It seems that no allies were gained, no progress made. My writing this column does not prove that the protest did its job. While I am committed to supporting every example of students being passionate and courageous enough to speak out about an issue that is important to them, I am equally committed to criticizing speech that is ineffective, divisive, counterproductive and alienating. Embracing and actively considering the free speech exhibited last weekend has led me here. Protests should not be held to a standard of perfection and ignored if they do not achieve it, but they must be evaluated on some standard. Looking directly at the issues, this protest did not succeed — at least, not on any metric that I can support. Dartmouth students are far too ignorant regarding the issues facing minorities outside — and even inside — of our little bubble, but this protest did not increase awareness or partnership. Protesting your peers is not the way to correct their ignorance.